While most of the museums in India’s major cities have troubling infrastructure, this one stands apart. Also known as the Prince of Wales Museum, it was commissioned in 1909 to commemorate the future king’s visit. Most of the collection was gifted by the Tata family and highlights include antique swords and Chinese ceramics. Arguably the most impressive pieces are in the sculpture gallery, where the beauty of dancing gods and goddesses frozen in stone are sure to delight. Could there be a more magical setting? The city overlooks Lake Pichola and the Taj Lake Palace Hotel, possibly the world’s most enchanting hotel setting. 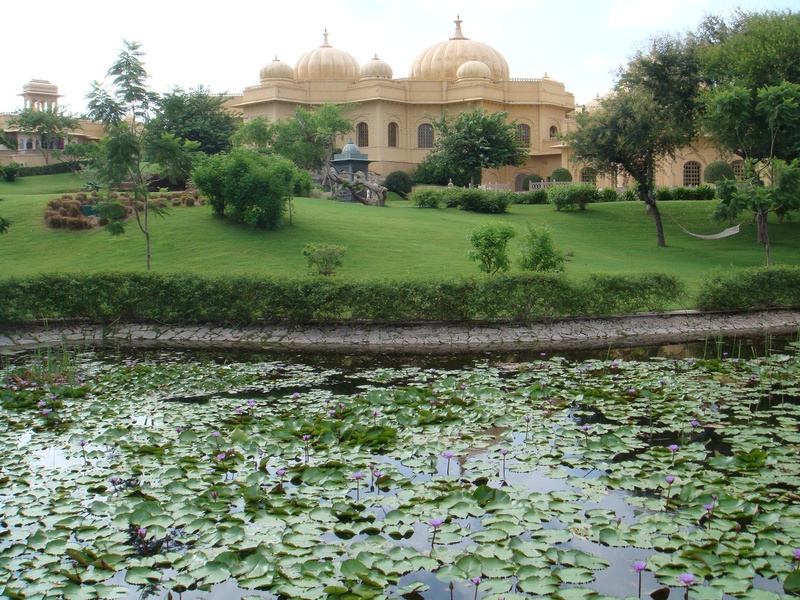 Stay at the Taj for old-world charm and soul, or stay at the Oberoi Udaivilas for modern opulence and amenities. Visit the City Palace, home to four major palaces and several smaller ones. 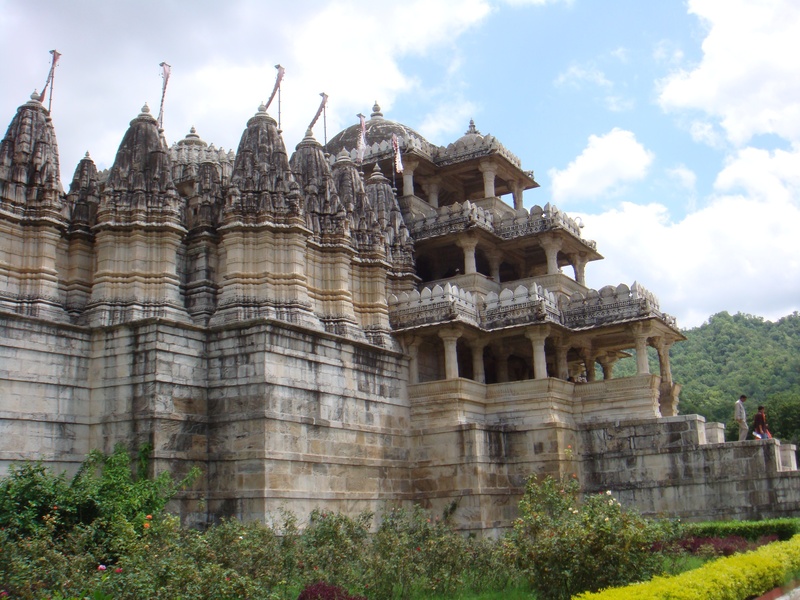 If you are interested in a worthwhile day-trip, then voyage to the stunning Ranakpur Temple. 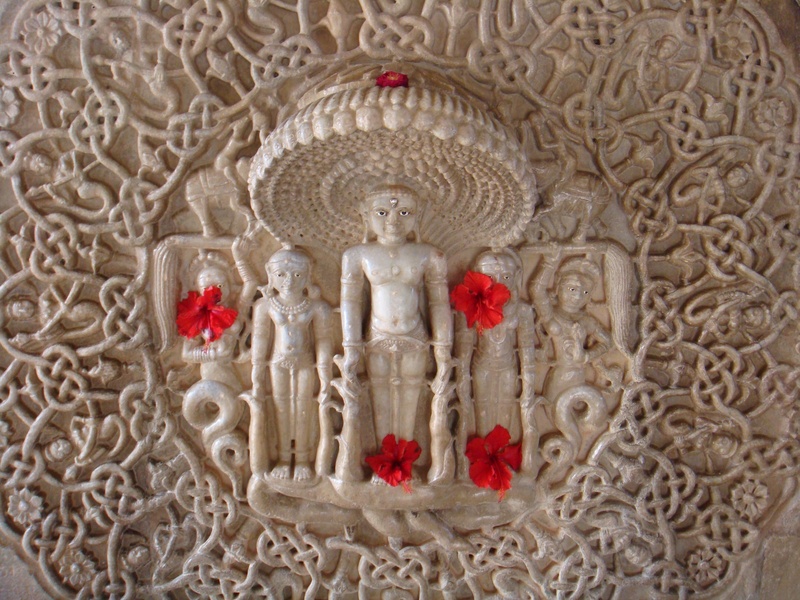 Constructed in gleaming white marble with intricate carvings, Ranakpur is one of the holiest places for Jains. Put this at the top of your Rajasthan list! 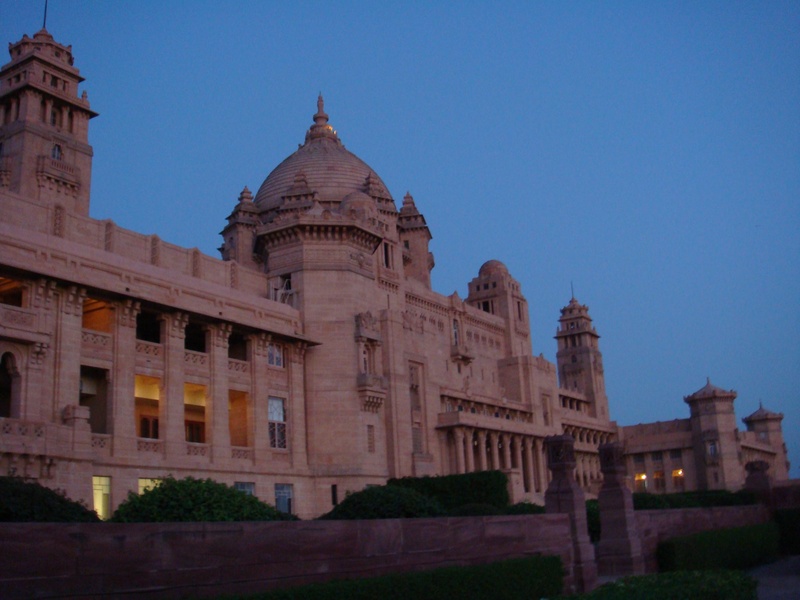 The incredible Umaid Bhawan Palace is one of the world’s largest private residences, containing 347 rooms and set upon 26 acres. Edwardian architect Henry Lanchester designed the modern-day castle for the young Maharaja Umaid Singh and construction finished in 1943. Rumor has it that the original Art Deco furniture for the palace was on a ship sunken by a German U-Boat. The royal family still resides in a portion of the palace while Taj manages the hotel. Dine outside and take in the view of the Mehrangarh Fort, lush hotel grounds, and peacocks wandering about. Towering 400 feet above the Blue City, the Mehrangarh Fort contains several palaces and galleries. Highlights include the armory collection and several adorned palanquins used to covertly carry maharanis. The fort was constructed for optimum protection as 7 gates shield the outside world. 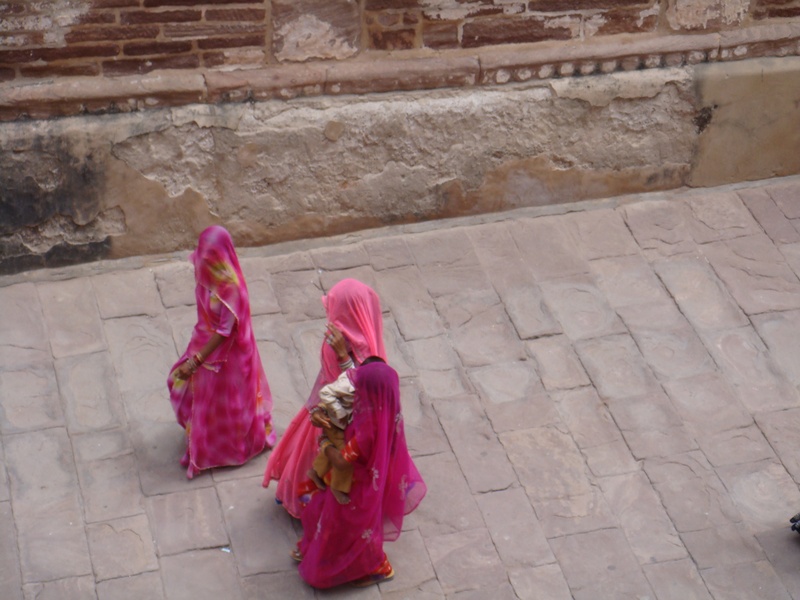 Gaze down upon Jodhpur and notice how the old city walls provide a stark contrast against indigo buildings of the past. A tribute to love and a life that ends in despair. Mughal Emperor Shah Jahan built the impressive mausoleum to honor his wife after she died having their 14th child. The grief-stricken ruler was later imprisoned by his son and died in a tower overlooking the Taj Mahal. Visit the Lil Qila (Red Fort) to see the spot where he lived out his final days. The most spectacular aspect of the Taj Mahal is the way in which the light glows upon this masterpiece of Mughal architecture. Go at morning’s first light for the most memorable experience. Mark Twain wrote: “Benares is older than history, older than tradition, older even than legend, and looks twice as old as all of them put together. “ Truth be told, Mark Twain was correct. This ancient city on the west bank of the Ganges is one of the most sacred places for Hindus. Each year over 1,000,000 people arrive to bathe in its holy (and also extremely polluted) waters. Arrange for a boat ahead of time with your concierge and then gaze at the city and ghats from the water. It is at times overwhelming as you watch cremations and people drinking water where cows happily bathe, but a cultural experience not to be missed. The city of Mother Teresa gets a bad wrap. Kolkata is noticeably more organized and cleaner than other large Indian cities like Delhi and Mumbai. The Victoria Memorial offers a comprehensive history of India and the Indian Museum Kolkata’s sculpture collection is a must see. Among the most extraordinary pieces are 10th Century Pala statues from Bengal and Bihar. Spend time at the Kalighat Temple and walk down the street to see Mother Teresa’s Home for the Dying. Take some time to speak with a volunteer to learn about their compassionate work. If shopping is on your list of to-do’s, then ask your concierge to point you towards the closest Ritu Kumar store for exquisite formal sarees. Treasures of Northern India | ArtsÉtoile. And I do have a couple of questions for yyou if it’s allright. oof all of alll your pubkic pages likje your twitter feed, Fcebook page or linmedin profile? or reviews, but this website presents feature based writing. believe just how so much time I had spent for this information! Thank you! an impressive activity and our entire community will be thankful to you.